Thanks again to social media, I was educated of a new restaurant that has high reviews and been recommended to try. 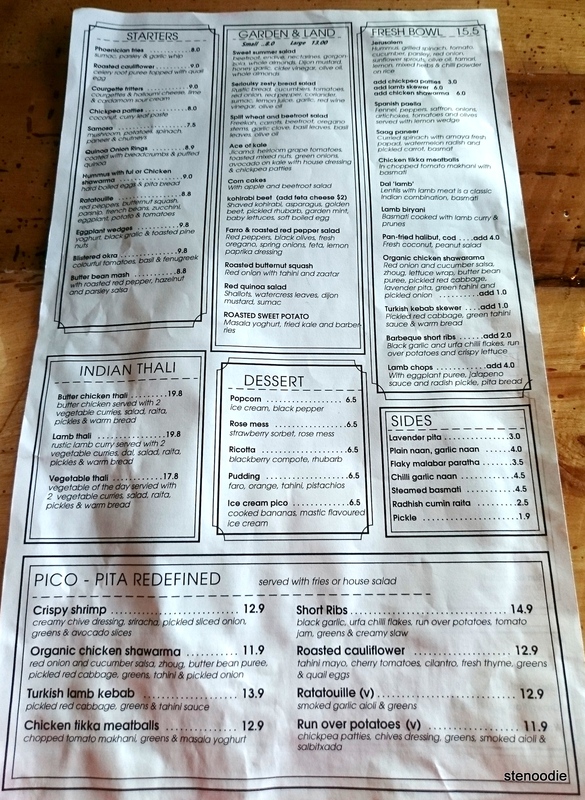 The Fat Beet can be considered a vegetarian restaurant based on the number of vegetarian dishes they have on their menu (and also, its name highly suggests a vegetable-serving restaurant). 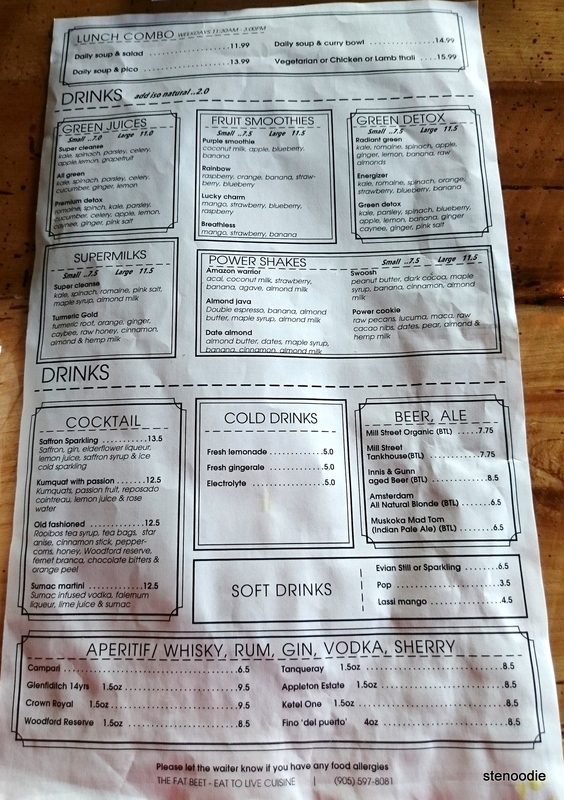 However, they actually do have some meat and fish dishes on their menu which negates my initial understanding that they were purely a vegetarian restaurant. 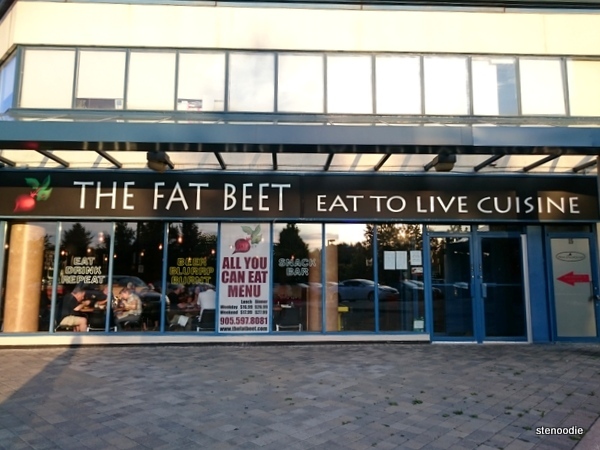 The Fat Beet is located in Thornhill at the base of an apartment building close to Yonge Street north of Steeles Ave. There were lots of parking available. Angel and I met up here for dinner on a Saturday evening. We were one of the first ones here so it was quiet at first. 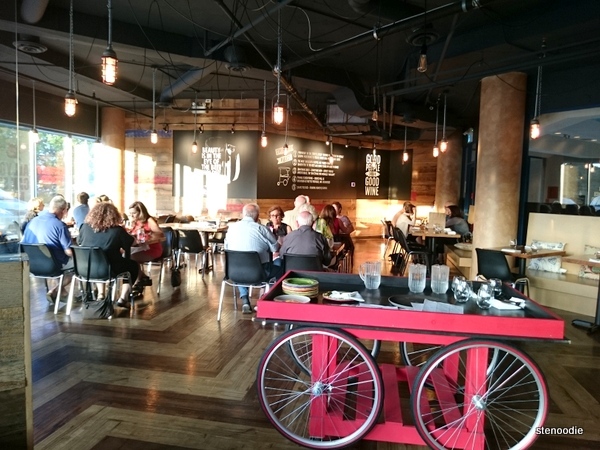 The Fat Beet is a casual restaurant serving up Indian, Israeli, and Middle Eastern food. I have been interested in eating more vegetarian food lately, thus I chose the Roasted Cauliflower dish. 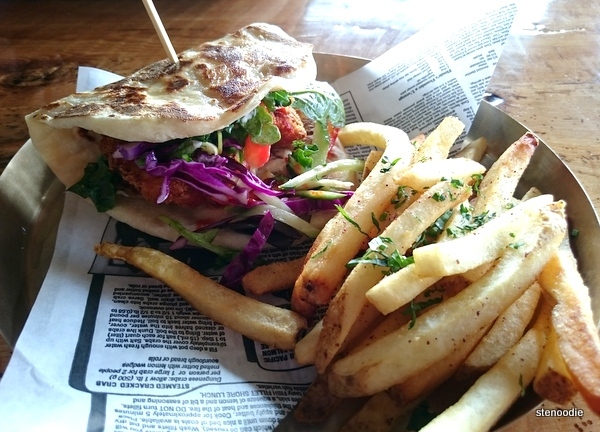 Angel ordered the Crispy Shrimp dish on pico (pita) bread and suggested that we could share ours. 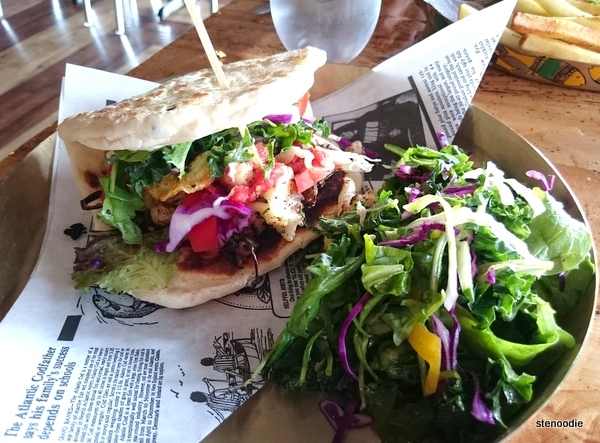 (There is a Roasted Cauliflower appetizer and also one that is served on pico bread like a sandwich.) 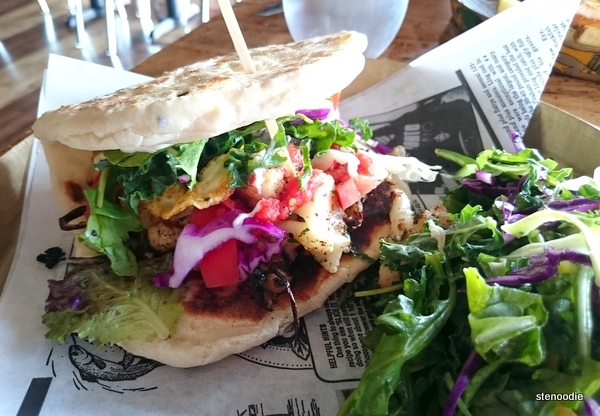 Thus, on this visit, I got to try the Crispy Shrimp on pico bread too. The Roasted Cauliflower contained tahini mayo, cherry tomatoes, cilantro, fresh thyme, greens, and quail eggs. It came with a side of fries or house salad. I chose the house salad. 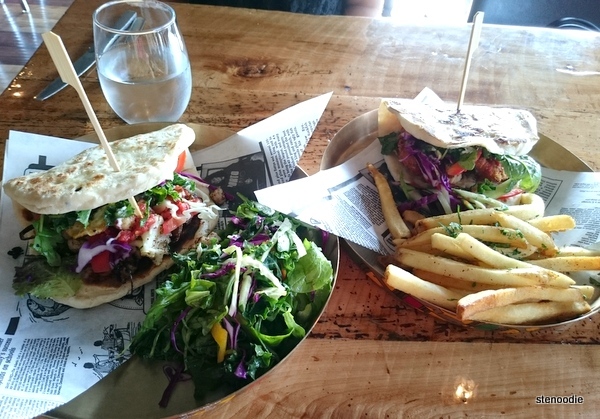 Two types of healthy dishes on Pico! The Crispy Shrimp on Pico came with creamy chive dressing, sriracha pickled sliced onion, greens, and avocado slices. Angel picked fries as her side. We split up our pico breads (a cross between a taco and pita bread — so smart) and tried each other’s selection. I ended up really liking the Crispy Shrimp! The shrimp was flattened and a really big portion in the pico bread. It was flavoured really nicely with the creamy chive dressing although I didn’t detect much of the creamy avocado slices in it — I think it tasted unripe so I couldn’t taste the typical avocado flavour much. The Roasted Cauliflower on Pico was still very delicious actually because it was so light and contained all vegetables. I felt good eating it too. The house salad was so fresh and juicy! The fries were firm and dense potato fries that were actually really good. This entry was posted in Food and tagged 7330 Yonge Street, @fat_beet twitter, Crispy Shrimp on pico, food blog, foodie, Indian, live to eat cuisine, Mediterranean, Middle Eastern, restaurant review, Roasted Cauliflower on pico, The Fat Beet, The Fat Beet lunch and drinks menu, The Fat Beet reviews, Thornhill, Toronto, Vegetarian. Bookmark the permalink.